Dynaudio Emit 5.1 review | What Hi-Fi? If history has taught us anything, it’s that those hungry for power are usually the ones least deserving of it. On the other hand, if you fall into that category and want to put it to good use, Dynaudio has made sure you can get some proper welly in your home cinema without having to remortgage the house. 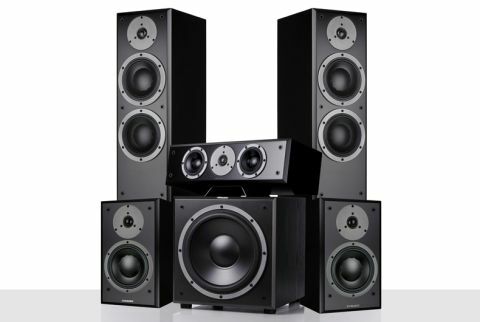 The Emit family replaces Dynaudio’s now discontinued DM range, and comprises a pair of large standmount speakers (M20), floorstanders (M30) and a centre designed exclusively for home cinema use (M15C). There isn’t a dedicated subwoofer for the package, but Dynaudio offers a £400 reduction on its SUB 600, bringing it down to a grand if purchased alongside an Emit 5.1 system. As the company’s most advanced available sub, its 300W amplifier powers a 30cm, forward-firing driver that promises to make your walls vibrate. Sporting a 28mm soft dome tweeter and 17cm magnesium silicate polymer mid/bass driver, specifically designed for the Emit models, the M20s’ immense scale, energy and sweeping dynamics earned them the Product of the Year crown for stereo speakers. In our review of the M30s as standalone hi-fi speakers, we were pleased with their detailed, authoritative performance, though they didn’t quite hit the dizzy heights of their smaller siblings. In terms of specification, it’s similar to the M20s, with the same tweeter and two-way crossover, but with two of the 17cm drivers to properly rattle that grander cabinet. On the centre, a pair of 11cm magnesium silicate polymer drivers again flanks the same tweeter. Also included is a detachable metal plinth, which angles the M15C to fire up or down, dependent on listening position. In theory, this negates the need for a separate speaker stand if you have a TV rack or similar already placed below your screen. Setting the floorstanding M30s up as our front speakers and the M20s behind us, we plug into our reference Yamaha RX-A3060 AV amp and play the riotously funny The Nice Guys on Blu-ray. Immediately we notice that familiarly weighty performance from the M30s, which, in conjunction with the SUB 600, assaults us with the full force of gunshots and car crashes. That’s not to ignore the detail on offer, however. The power and grit are pooled with genuine talent, not just the will to smack you between the eyes. There’s a good job made of the film’s funk-drenched soundtrack, trickling nicely beneath rustling papers and clinking glasses as it does breaking bones and good old-fashioned explosions. The M20s are particularly impressive as surrounds; that same insight and sense of timing and dynamics standing out, but unfortunately, the matching isn’t superb. Whereas the similarly-priced ATC C1, our 2016 Award winner at this price, benefits from the same speakers in each corner to offer a notable uniform performance, complimenting rather than competing with each other, there seems to be a slight disconnect between the M20s, M30s and M15C that doesn’t always allow an entirely immersive experience. It could do with a bit more expression though. Our main gripe is with the M15C centre. It comes across as a bit meek, allowing itself to be shadowed by the scale of the rest of the package. There isn’t a great deal of expression on offer, either; voices lack the subtle dynamics that expose the deadpan deliveries and wit that are the basis of the film’s absurdist humour. As a little experiment, we replace the centre speaker with one of the M20s and suddenly the sound is transformed, recouping all expression and adding that shot of adrenaline that energises the film. Neither does it seem so overpowered by the combined strength of the M30s and muscular SUB 600. Dynaudio has put together a speaker package with much to admire in the Emit 5.1. It certainly doesn’t lack for presence or detail, and could be more suitable than even the Award-winning ATC C1 for those with larger living rooms. It’s a true powerhouse that’ll have many home cinemas shaking.